The following, except for my comments, comes from Breitbart and their contributor, Lindsay Leveen. 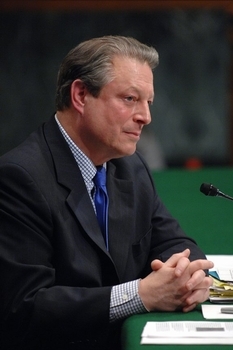 Al Gore published a book, made a movie, and won a Nobel Peace prize for his thesis on global warming. The unfortunate thing is he then entered into the venture capital world and brought upon us expensive Betamax technology such as the Fisker Automobile and the Bloom Energy Fuel Cell. Had Al stopped at the movie or just winning the Nobel prize he may never had to face the most fundamental laws of thermodynamics that unfortunately for him, his investors, his political party, his Washington friends, and the US tax payers as a whole disproved his whole notion that cheap electric cars would proliferate and cheap electric power for these electric cars would be generated in his fuel cells. I learned thermodynamics while at Iowa State University and I wrote academic papers on the subject. I wrote a book that is university text at almost the same time Al was winning acclaim for his book and his matters green. A few thousand university students and a few hundred laypeople have read my book and learned the fundamental yet inconvenient truth that the second law of thermodynamics allows nothing to come for free. I reached out to the US Senate to plead with them based on thermodynamics that much money would be wasted on lithium ion batteries and on fuel cells. My testimony had to be provided as outside witness testimony as I did not have the political connection and my Congresswoman simply ignored me. But at least I provided that testimony 30 months ago and foretold how thermodynamics would prevail and much money and time would be wasted. Fast forward. Bloom Energy may yet see 884 as its fatal number. Fisker is on its last legs and their Delaware project is Dead On Arrival. Fisker’s battery supplier A 123 is almost out of electrons and has taken on toxic financing. This is after A 123 had already received $129 million in US DOE grants. Fisker and Bloom lead A 123 by a few months in the toxic financing arena with their association with Advanced Equities, a firm that is now under SEC investigation. Valence Technology and Ener1 two other US advanced lithium ion battery manufacturers are already bankrupt. Finally Wall Street has caught onto Tesla being a mirage, and within a year we will all be talking about the $500 million wasted by the DOE on Tesla. As for me, I can sadly say I told you so, but these numerous examples of rapid and massive waste of taxpayers’ money makes me even sadder as we still import oil from horrible countries. Had Steven Chu really learned his thermodynamics he would have told his boss about the real inconvenient truth. Instead he either intended that the US should fail, or that hope could overcome the second law of thermodynamics. As he won a real Nobel Prize in low temperature physics, he had to know that hope could not prevail, which then leaves me to think he had no interest in the USA formulating and executing a viable energy policy and that he wanted failure as he had no interest in us succeeding. Al Gore did not understand the basics of thermodynamics and he is simply a greedy politician who wants admiration from crowds of followers. He and his VC friends are now out of money and time for the junk and expensive technology they promoted. They are all out of friends and free money from the taxpayers. Their IPOs are postponed or cancelled as Wall Street has learned of the inconvenient truth of thermodynamics. Their only remaining hope is to use pay day loan sharks to keep their green-tech hopes alive. Ivan Boesky and Mike Milken brought us junk bonds. Al Gore, Kleiner Perkins, and the US DOE brought us junk science. Ivan and Mike had to sit it out for a while. I wonder if Al and Steve will ever be held accountable or they will just manage to blame it all on bad luck or the previous administration.